The Gaslamp Quarter Association is pulling out all the stops for the GBOD Group Gaslamp 150th Gala presented by Trilogy Real Estate Management with a decadent evening of exquisite cuisines, inspired libations, unique fundraising, and live music set under the stars in the center of Fifth Avenue. Twinkling lights, hanging florals, and gold motifs of rabbits and carrots will adorn the sky as the sun sets on ornately decorated tables set with fine china for a three-course meal with wine and craft beer pairings. It is not every day that we can shut down the streets of the Gaslamp Quarter to dine, drink, and dance with abandon – now is our chance! Sponsorship opportunities are also available! See below for details. The Gaslamp Quarter Association is pulling out all the stops in celebration of the Gaslamp Quarter’s 150th Anniversary with a decadent evening of exquisite cuisines, inspired libations, unique fundraising, and live music set under the stars in the center of Fifth Avenue. Twinkling lights, hanging florals, and gold motifs of rabbits and carrots will adorn the sky as the sun sets on ornately decorated tables set with fine china for a three-course meal with wine and craft beer pairings. It is not every day that we can shut down the streets of the Gaslamp Quarter to dine, drink, and dance with abandon – now is our chance! The GBOD Group Gaslamp 150th Gala presented by Trilogy Real Estate Management begins at 5:30pm with a hosted reception at the Hard Rock Hotel, a silent auction of incredible auction packages along with appetizer selections from 10 Gaslamp Quarter eateries and beverage service. Once the silent auction wraps up, guests will make their way to Fifth Avenue for an evening to remember. Dinner guests not only get to feast on spectacular menu items, but can make their way to the dance floor flanked by LED screens and a raised stage. An exclusive showing of the Rabbitville Rabbit statues will line the perimeter adding to the ambiance before being auctioned off in a live auction. 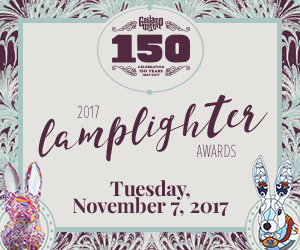 The proceeds from the Lamplighter auction benefit the Gaslamp Quarter Association, the official non-profit 501(c)6 trade organization of the Gaslamp Quarter. Your donation will help to raise crucial funds needed for the ongoing development of capital improvements and promotional programming for the Gaslamp Quarter. Past projects include the iconic Gaslamp archway, refurbishment of our brick sidewalks, the development of a sophisticated website (Gaslamp.org), and much more. Your contributions are wisely invested and leveraged to continue promoting and enhancing our amazing historic district! For More Information, Please Click Here to See Sponsor Brochure.